I don’t know if our culture has bred an entire generation of narcissists, if we have more information available to us today about narcissism, or if placing that label on the one who broke our hearts makes it easier to understand what happened for the purpose of moving on. Maybe it’s a combination of those things. Just as I have a large number of clients who have experienced emotional abuse, I’ve also coached a lot of women who were involved with a narcissist and trying to recover from what was a destructive relationship, as relationships with narcissists always are. That’s because breaking up with a narcissist and moving on is incredibly difficult to do. The manipulation these women, my clients, experience throughout the relationship and following a breakup can crush their self-esteem, destroy their emotional foundation, and make them believe they’re going crazy. 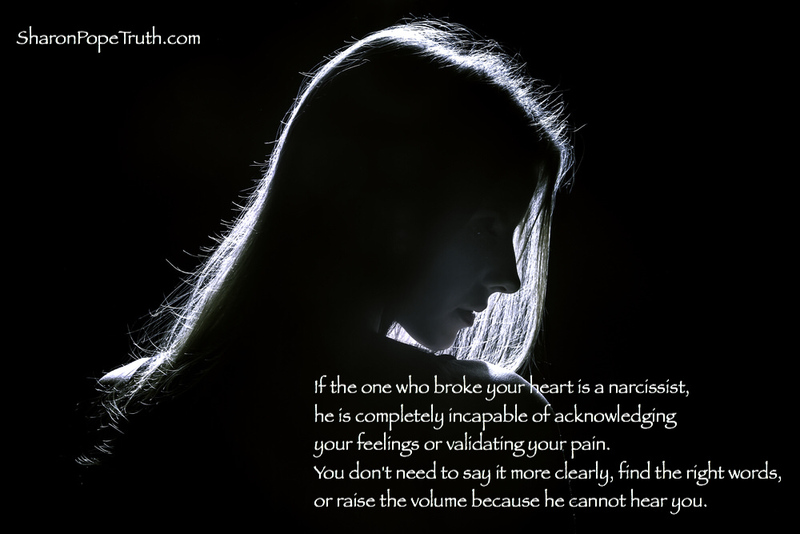 Getting over a narcissist can be a long and painful process. So it’s not surprising that these women reach out for help. A ton of information has been written about how to identify narcissists – much of it written by psychologists and psychiatrists – because narcissism is a disorder, it’s not curable, and it’s incredibly dangerous. They have an over-inflated sense of self-importance: The world revolves around them. They have a sense of entitlement: If they want it, they believe they can have it, regardless of consequences or impact to others. They require constant admiration and attention: They turn conversations and the spotlight on themselves. They manipulate people to serve their own interests: They get people to do what they want through manipulation and withholding love. They are constantly dissatisfied: They will take whatever you have to give and always want more. Takers always find givers. They lack empathy: They cannot see what they’re doing and they have no regrets about their actions. They lie easily: Because they believe they can and should have whatever they want, lying is just part of their process. They are incapable of intimacy: They cannot have deep conversations about purpose or meaning and cannot share their hearts, not because they’re holding out, but because there isn’t anything there to share. They can quickly and easily move on after a relationship ends: They never want their cadre of admirers to dry up, so they need to continually replenish. Even when the relationship is over, your narcissist may continue to try to pull you back in, time and again. Not necessarily because he wants to get back together with you, but so that he still has you in the harem of admirers he can control and from which he derives his self-worth. He is completely incapable of acknowledging your feelings or understanding and validating your pain. You don’t need to say it more clearly, find the right words, or raise the volume, because he cannot hear you. If you don’t have children together or any other tie that forces you to remain in communication with him, cut off all contact. Complete cold turkey. Unfriend him, unfollow him, and lose his number. That is a hard and clear boundary and the only way to protect yourself. He will not change, I promise you. He cannot change. You cannot love him enough to change him. Narcissism is a disorder. And it’s brutal to your soul.